Exceptionally Powerful, Fast-Working Ice Melt for Extreme Weather Conditions. Figuring out which ice melt product to use shouldn’t be a mind-numbing experience, especially when it’s mind-numbingly cold outside. Flash Melt® Ice and Snow Melt is the easy choice when temperatures get down to -25 °F / -31 °C. 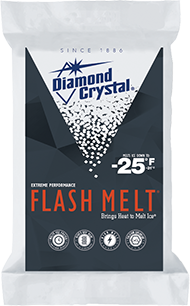 Flash Melt® Ice Melt contains Calcium Chloride that gives off heat as it dissolves, liquefying ice more quickly than any other ice melt out there. Directions: Remove slush and as much loose snow as possible before ice melt application. Spread Flash Melt® Ice Melt evenly across surface area. Apply ¼–½ cup per square yard using a scoop, depending on ice thickness and air temperature, as needed. Reapply as necessary. When ice and snow soften, remove slush and any excess ice melt from pavement for good concrete maintenance. Flash Melt® Ice Melt works quickly in temperatures as low as -25 °F / -31 °C. It is 100% Calcium Chloride.